Maybe the most iconic baseball card photo ever, but of course it’s not the most iconic baseball photo in history (hello, Charles Conlon‘s Ty Cobb), but the image of that card — 1989 Upper Deck No. 1 — needs no explanation. Anyone who grew up collecting cards in the 1980s and ’90s knows this one, probably owns it. 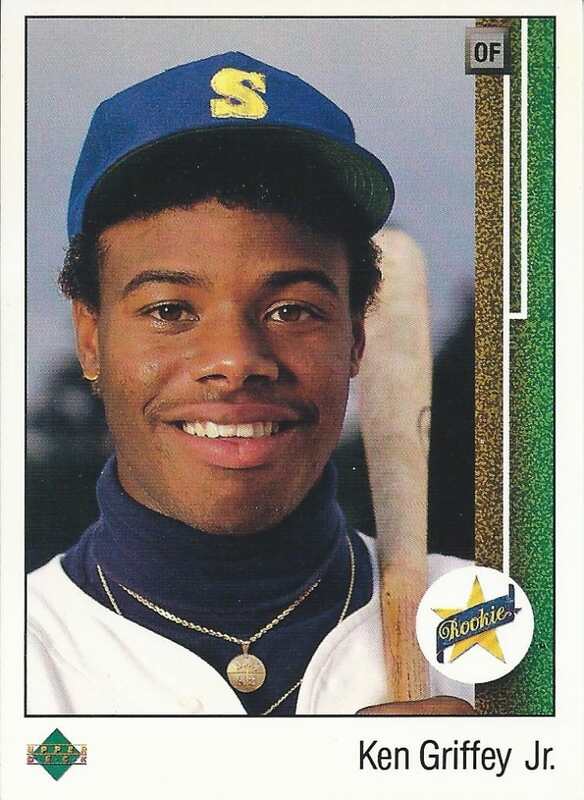 Five-and-a-half years ago, when Griffey announced his retirement, I reflected on some of my memories of his career, including those of this card. So with another Griffey career milestone on deck, here’s how I came to acquire this card in my collection nearly 30 years ago. Dad wasn’t there yet, so I sat down on a bench to wait, looking through my new purchases. I don’t remember a single thing I bought at that show, but I remember a collector stopping to chat with me as he headed inside with a briefcase of cards. I don’t remember what we talked about to break the ice, but I do know that he asked where I was from and when I said I grew up near the Jersey Shore and Sandy Hook, he knew that area. At some point, the Griffey card came up and he opened his brief case and handed me one. I looked it over closely; I had never held one — it was in a protective sleeve, but it was still the first time I’d been able to examine one so closely, on my own terms. As Darren Rovell wrote in that Slate piece, this was a card that came to define a generation of collectors. At the time, we couldn’t see it in that light, but we still knew it was a collecting status symbol, a benchmark, a cardboard holy grail to attain. I wonder if that guy remembers giving me the card for free. He was pretty young, so he could easily still be alive. And considering the way the card industry crashed in the ’90s, it’s not like he handed me a car — or even a fancy dinner — that day. But it sure felt like it at the time.